About Midday yesterday Battalion Observers noticed that the enemy had removed how wire at G.12.c.45.95. Suspecting a hostile Raid Officer Commanding 6th Sherwood Foresters took precautionary measures by strengthening posts at BRESLAU and LOOKOUT. The 8th Battalion, Sherwood Foresters on the left were also informed of this and they made special arrangements to co-operate by rearranging their Lewis Guns to cover N- Mans Land in the threatened area. At 5.45 pm. 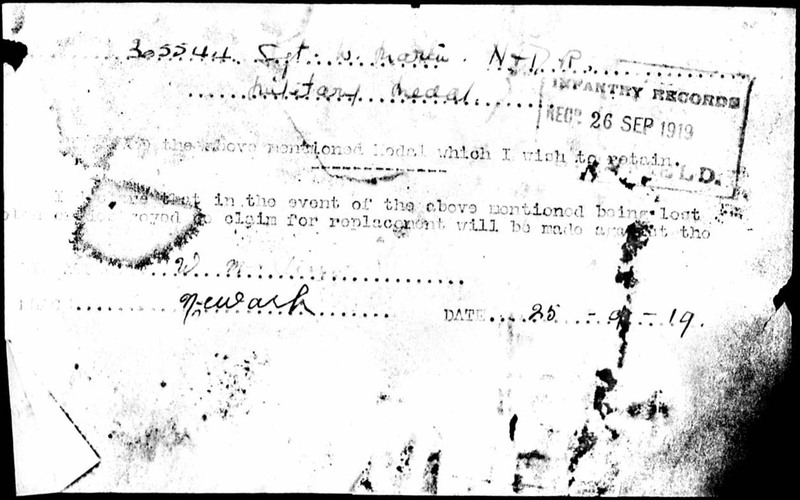 the 6th Battalion Sherwood Foresters sent to a Fighting Patrol of 2 Officers and 25 O. Ranks from LOOKOUT POST to investigate the enemy gap, enter the hostile trenches and obtain prisoners. Special arrangements were made with the Artillery in connection with this. Owing to watchfulness on the part of the enemy it took some time to reach the enemy wire. A party of the enemy was located in front of his wire opposite BRESLAU who fired and bombed our men before they had time to rush them. The enemy was driven off by Rifle & Lewis Gun fire. A few of our men succeeded in entering the enemy trenches and engaged his posts with rifle fire and bombs but were unable to obtain a prisoner and withdrew. We had a few men wounded and all were back in our trenches by 8 pm. At 9.20 pm. a very heavy bombardment was opened by the enemy from South of HULLUCH ROAD to North of HAIRPIN CRATERS, this extended later further North and eventually covered practically the whole of the Brigade Front. Parties of the enemy were seen approaching LOOKOUT & BRESLAU Posts and “S.O.S. LANCER” was sent through. Our Machine guns and Artillery and Trench Mortars opened out rapidly and it is thought they must have inflicted heavy casualties on the enemy. At the time all our Posts were standing to an opened heavy Lewis Gun and Rifle fire, particularly across the North side of LOOKOUT Post, where large numbers of the enemy were seen. The whole of No Mans Land between HAIRPIN CRATERS & LANCER was plastered with Lewis Gun and Rifle fire. On the 6th Battalion S.F. 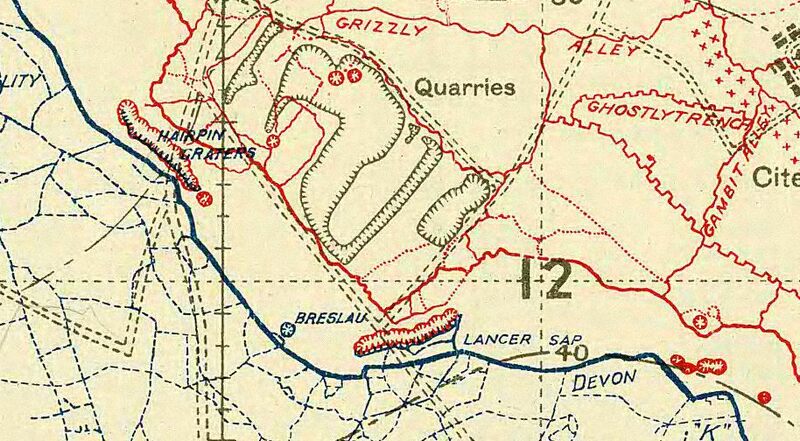 front the enemy attempted in strength to approach our posts at LANCER via LANCER Craters, but were driven off with bombs and rifle fire; at the same time another party also in strength attempted to enter BRESLAU Post but were driven off by Lewis Gun and Rifle fire. None of our posts were at any time entered. It is thought that the enemy sustained heavy casualties in these attempts. Owing to the difficulty in communicating with the Company in HAIRPIN CRATERS and arranging for them to cease fire, some time elapsed before patrols could be sent out to search for enemy dead, this unfortunately gave the enemy time to remove his casualties. Our casualties in this Battalion were 2 killed, and 9 wounded all of which were the result of the enemy barrage. On the 8th Battalion S.F. front owing to “SOS LANCER” practically covering HAIRPIN CRATERS the Company Commander did not consider it necessary to send “ATTACK QUARRIES”. Between 9.35 & 9.45 pm. various enemy groups approached the Post to the rear and left of HAIRPIN i.e. STUDIO II and RAT CREEK. The groups appeared to consist of 8-12 men. All groups seemed quite confused and our men had no difficulty in driving them off with Rifle and Lewis Gun fire. One of the enemy parties on being challenged replied “FREUND” and another “SECHSISCHE”. Smoke bombs fell in HAIRPIN CRATERS which made some men think there was gas. Two of the enemy were seen approaching a Post South of HAIRPIN, our men rushed out and took them prisoners. When the barrage died down at about 10 pm. patrols were sent out and one German was found about 40 yards from STUDIO II Post. No further trace could be found of any of the enemy. The casualties in this Battalion were 1 Officer and 7 O. Ranks wounded (none serious). In both battalions we were ready for the Raid and all ranks showed considerable coolness. The keenness and action of Lewis Gun teams was very marked. It is difficult to estimate the exact strength of the raiding party, but it is estimated at between 150 and 200 men. 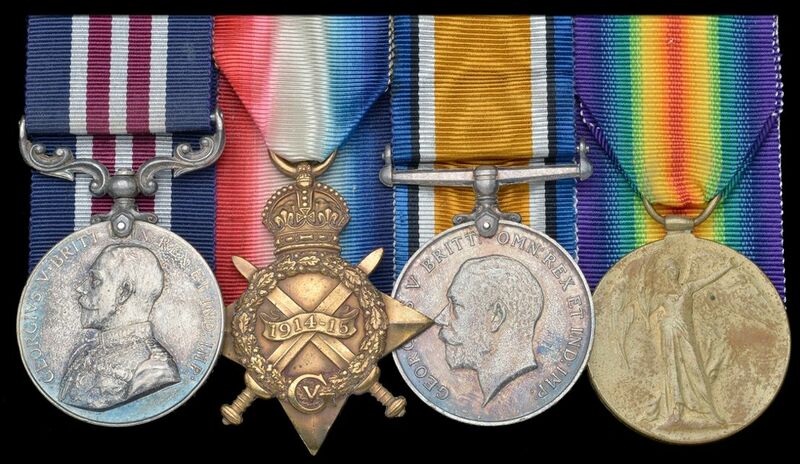 William had enlisted on the 10th September 1914 and arrived in France with the 46th Division on 25th February 1915.